Business leaders face a number of challenges from within and outside their organizations. Profitability and business growth, customer loyalty and advocacy, the acquisition and retention of top talent, corporate reputation, change and risk management are major responsibilities and senior managers need to master them all in equal measures to achieve true business success. In Teleopti’s experience with our own customers, two areas are vital to achieving business success that endures over the long-term, these are effective customer experience (CX) and employee engagement. At the same time, digitalization is transforming and enabling the way organizations do business with customers and engage internally with employees. 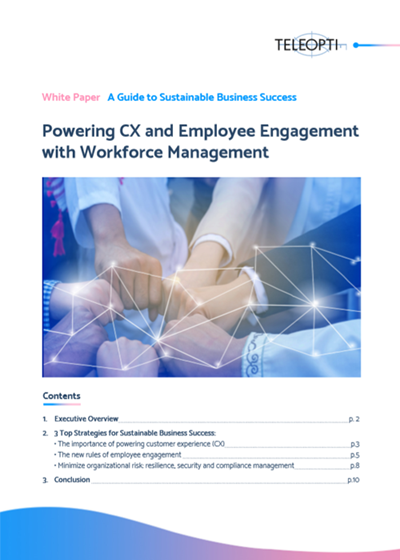 Download this white paper which outlines 3 key strategies to achieve sustainable business success by using Workforce Management (WFM) technology to power CX and employee engagement.